The New Year! At this time of fresh starts, I always find myself reorganizing my writing desk. It’s as if I actually believe that getting it under control will give me control over all other facets of my life—which is, I realize on these occasions, a life influenced by desks and lived at various desks. I was too young to remember the first desk I must have seen. It wasn’t really a desk but a work table, which Dan, my father, set up in an empty hen house on the farm where I spent my first three years. There, when he wasn’t coping with the full hen house and the other farm work, he wrote short stories. But I do remember this table in the apartment we moved to in town, after my sister was born and the Second World War began (just a coincidence!) and he went to work at the town’s biggest factory (such as the fictional Trask’s in The Snowy Series). It was a small wooden table in my parents’ bedroom, under the front bay window. On it sat a big heavy Remington typewriter, with a ream of manila second sheets stacked alongside. This was where he wrote at night and on weekends: stories, a novelette, and most of his first novel, The Crystal Years. And as I mentioned there, Ernie, our mother, had her own desk, from her old bedroom in her parents’ home in Lexington, Massachusetts. 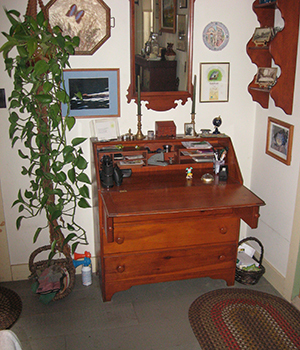 It was a little mahogany “secretary” style of desk, fascinating in a different way from Dan’s, with stamps and stationery and bills and checkbook and savings book in its pigeonholes and drawers. Here she handled the running of the household. By the time I started elementary school, I too had my very own desk, child-size, wooden, painted white, a blue blotter on its slanted front and a bookshelf underneath. How I loved it! Sitting at it, like Dan at his typewriter, I wrote stories that I illustrated with crayons or by cutting up greeting cards and Christmas cards. I chose more interesting names for my heroines than my plain one, such as Dimity and Aqua. In February 1951, just before I turned twelve, we moved to the house that Ernie and Dan bought across town. In honor of this great event our grandparents gave Penny and me each a grownup desk, mahogany veneer, flat-topped with eight drawers (one of which was a deep double drawer in which I stored my loose-leaf notebook-journals). Decades later, I in turn gave desks like it to Snowy and Bev in The Cheerleader. This desk saw me through the rest of school until college. At Bennington, I had to adjust to a smaller desk. But when I transferred to Keene Teachers’ College to set up housekeeping with Don in an apartment in the married students’ barracks, I was reunited with my mahogany desk, which we moved there from Ernie and Dan’s house and put against the wall where the living room and kitchen met. Nearby, closer to the oil space-heater, was the blond Scandinavian-type kitchen table I’d bought from Montgomery Ward (so sophisticated), and it too served as a desk when I rolled up the rattan placemats that my best friend, Sally, had given me (along with orange linen napkins and long-tailed chipmunk salt-and-pepper shakers). On my Royal typewriter on the mahogany desk I wrote papers and letters and my first (unpublished!) novel. At the table, warmer near the heater, Don and I did longhand paperwork. Mainly we recall the arguments that we two English majors had over our Advanced Grammar homework. After our graduation, the desk was given to the daughter of a family friend. In the various places we rented as we moved to Massachusetts, back to New Hampshire, to England, Boston, and back again to New Hampshire, I first worked at a desk that Don made by attaching wrought-iron legs under a horizontal door. Then I worked on kitchen or dining-room tables, until in 1971 (as I describe in my essay, “One Minus One—Twice!”) we celebrated the publication of One Minus One by buying a big Steelcase desk and a typing table. When we bought a house, in Farmington, New Hampshire, these went with us—and once again I was reunited with the mahogany desk, the family-friend daughter having grown up and moved on. By now, the desk was showing some ravages of age, so Don repaired it and painted it my favorite color, green. In 1976 we moved to our Sandwich house, where I took over the unfinished upstairs for my garret. It has remained unfinished, because we concentrated on getting the downstairs habitable and by the time we could tend to the upstairs I had accumulated so much stuff the task seemed Herculean. 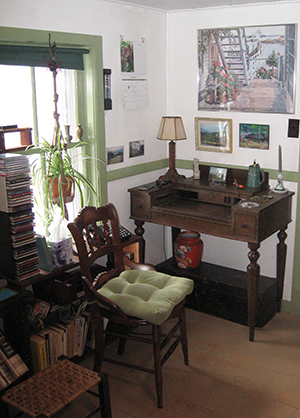 The green desk journeyed to Maine, to Penny’s daughter, Thane. Penny still has her own desk, and for a spell the two desks were back together. The green desk went to college with Thane and then returned to me. 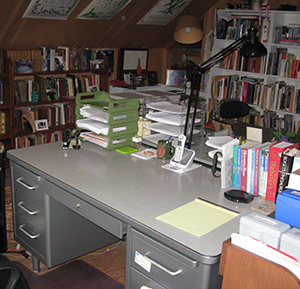 So here in the garret, the Steelcase desk and the green desk face each other, the former for writing, the latter for the odds and ends of daily life. 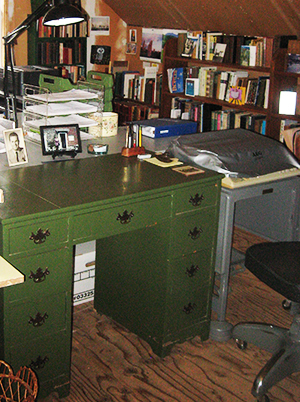 There are also a Staples computer desk, the old typing table and my last typewriter, and three work tables Don made, much like that desk he once made out of a door. Downstairs are three more desks. We have inherited the desk that Don built for his parents in a Laconia High School shop class. In Don’s office is a desk that belonged to my grandfather, which my father used in later years. And in the kitchen is my mother’s little desk. I keep stamps in the same drawer she did. © 2015 Ruth Doan MacDougall; all rights reserved.